Despatch: From 23rd April 2019. This super saver duo pack consists of 1 pack of Nemaslug (40m²) and 1 pack of Veg & Fruit Protection, giving you a saving of £3! 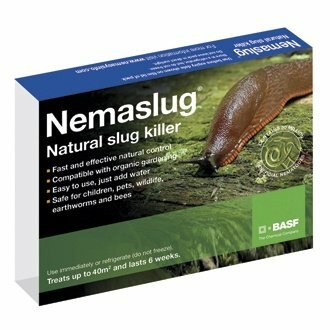 Contains microscopic worms (nematodes) which seek out slugs above and below ground and stop them feeding on your plants within 3 days. 1 application gives 6 weeks of control. - Targets all slug species. - Apply with a watering can to moist soil. - Minimum soil temperature is 5°C (40°F). - Application months: March- October. - Use year round for glasshouse application. - Soil or compost must be moist before and for at least 2 weeks after application, however avoid waterlogging. Apply during evenings or dull conditions. - Must be stored in refrigerator and used within best before date stated. - This pack fills 4 watering cans and treats up to 40m² (50sq. yards). A natural product containing a blend of different species of microscopic worms (nematodes) that controls many pest insects seen on many vegetables and fruit. -Carrot Root Fly, Cabbage Root Fly, Cutworm and Onion Fly, Ants - apply April to July. -Caterpillars and Gooseberry Sawfly, Thrips - apply May to October. -Codling Moth-apply September to October. -Avoid applications in bright sunlight. -Use entire packet and do not store made up solution.